← Corvair College #28, Feb 2014 in Texas. Sunday, a long day at the airport. Before any major airshow or a college we end up working a lot of hours in preparation. With our departure for CC#26 and the Zenith open house just 7.5 days away, things are in high gear here. This doesn’t mean frantic work, it means steady effort over long hours, seven days a week. I find what we do rewarding for many reasons, so I never consider long hours a problem. The setting of our home and work is a little grass strip in the woods, something of a little paradise in a rural setting, shared with 60 other aviators. I have lived and worked in many different places over the years, but I find this place very good antidote to the pressures of society, consumerism and all the trash that invades your life if you’re not paying attention. Below are a few photos that give a feel of a working weekend at our place. Above, Gratuitous dog photo. Grace sits with ScoobE before his last haircut. Neighbors Alex and Debbie sit with Kirby and Phoebe. Alex’s hangar is the late night gathering spot at our airport. He is a master chief and grills out most nights at 10pm, always making enough for whomever stops in. You can work a very long day, and still not be late for dinner and socializing at Alex’s. A very gifted person, he is a self-taught pilot of great skill. He and Debbie at prepping a 40′ sailboat for a voyage that should last several years. Having such friends is a powerful correction for all the negative people you encounter who will counsel you to give up on dreams just because they did. Deal Of The Day, 2700cc Gen. 2 Engine, w/rear alt. and HD oil sys. We still have the engine available, and the deal is still open for another 48 hours. We are going to bring this engine to CC#26 as a running demo. This is about the 20th engine I have built with Chris. He is an excellent assistant because he is very careful in his work and his standards are very high. He didn’t stay long after the photo, as he works the early shift at Grumman St. Augustine Monday through Thursday. Above, we gave the engine a 35 minute break in run. Grace took the photos, and I took this one of her. 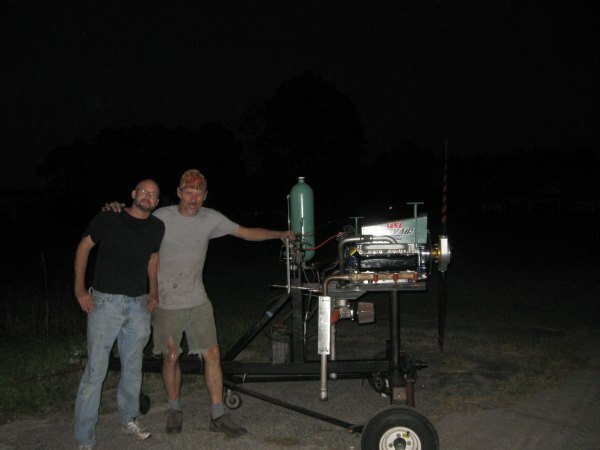 The test stand is chained down to a 700 pound concrete block that we cast into the front yard for this purpose. Just beyond the engine is the edge of our runway. it is 150′ wide and 2400′ long of very thick grass. It gets cut twice a week in the summer. Every single job at our airport, from mowing grass to state DOT and FAA paperwork, is done by volunteer labor from neighbors. We own our place, but we also own 1/40th of the airport, which cost a whopping $750. The annual dues per household are only $270, made possible by the volunteer work ethic of neighbors. The airport has functioned for 40 years by this formula, and it is an outstanding example of what energetic people with a common goal can achieve. Above, proof that I am a hypocrite. 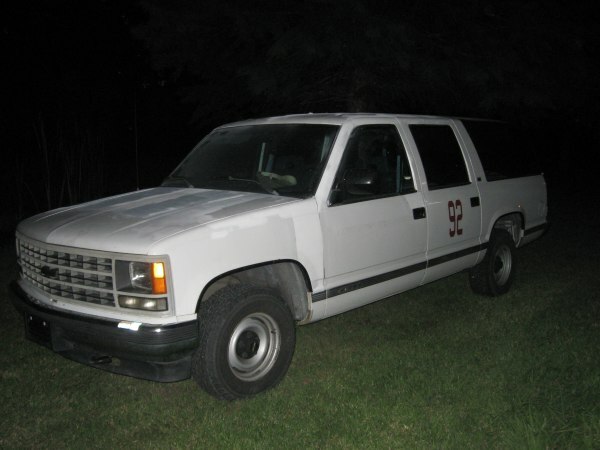 Four days after writing a story about how much I like simple machinery, I bought the above 1993 Chevy Suburban. While my simple pickups have been the backbone of our transportation to airshows and colleges, I will concede that we needed different wheels to travel with, especially since we are going back to the 4 college a year/ two major airshow travel schedule. Grace, ScoobE and I do OK in a standard pickup, but bringing support crew like Vern requires more seats. I have previously cursed EFI, and computers, but there is a lesson here: It is better to be a successful hypocrite than a zealot and a failure. Many people come to Corvair building with pet theories that they can not let go of, even if I can show them they are headed for trouble. They are zealots, because they are not flexible to learn and use things from outside their comfort zone. I may sound like that kind of person from time to time, but in reality, my only allegiance is to good decision-making and accomplishing the original goal. If the smart path turns out to be different that I predicted, I’ll let my friends tease me for being a hypocrite, but this is eminently preferable to failing as a zealot. The truck is actually a very simple fleet model with no frills, but an interesting history. 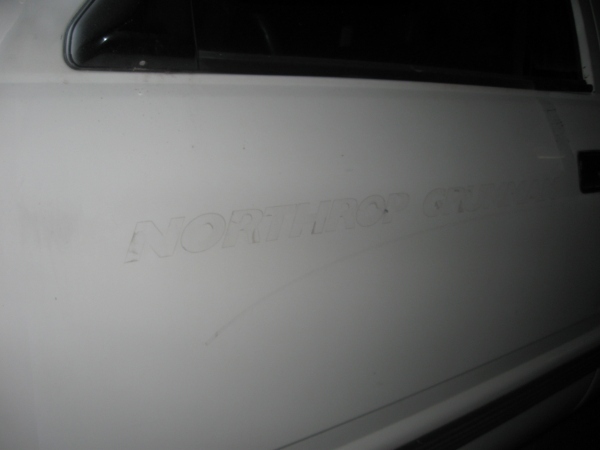 If you look at the close-up of the door, You can see that the previous owner was Northrop-Grumman. It was bought new by the California weapons system division, and later transferred to St. Augustine. It actually had a map and a set of directions on how to get to the test range inside Edwards Air Force base in the glove box. The “92” is to allow it to be addressed by the tower on the radio when on taxiways. It has numerous expired flight line decals on the bumpers from many different airports. The paint is flaking off, but it is a good deal because it only has 88,000 miles on it, had lifelong professional maintenance, runs perfectly and cost us only $1,700. Corvair core engines are not the only good deals on Craigslist. Using mechanical devices from outside to experience base is all about picking the right mechanical mentor, an instructor who knows his subject. If you are building a Corvair flight engine, I’m your man. When I wanted to know critical details and failure modes on the Suburban, I called Mark from Falcon, who happens to know this era of GM EFI systems inside and out. He ran over all the possible trouble modes and their prevention. The mechanical subject is different, but the route to success is exactly the same: Find the person with the first hand industry experience and good judgment and put away your biases and listen to him. A quick look at Vern’s latest project, a FAR 103 legal Ultralight similar to a Heath Baby Bullet. Just like his aero-trike, this is a tribute to his fabrication and scrounging skills. The plane is a one-off design of his own. The engine is a Mosler MMCB-40 2 cylinder four-stroke. It is wire braced with streamline wires from a small biplane. The landing gear is cub style, with a very small version of the style of spring-in-tube suspension that we build for Pietenpols. On weekends, Vern works on his project in our hangar. This way if we need him for an hour here and there in the day, he is readily available. 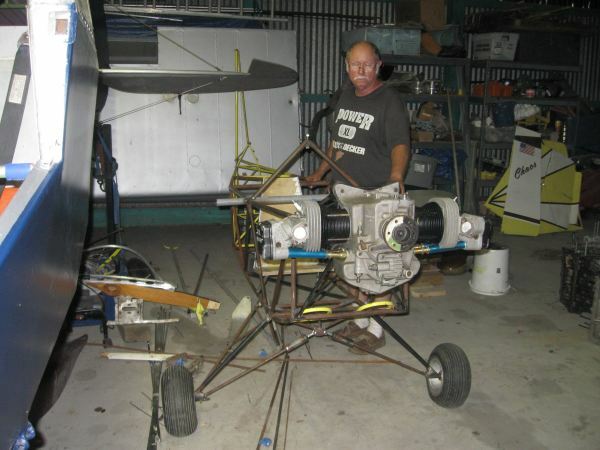 Sunday was almost 100% engine building in the workshop, so Vern used the day to weld out his fuselage. He test fit it all back together at 10:30pm. Last look before closing the hangar doors on a day that began 15 hours earlier. 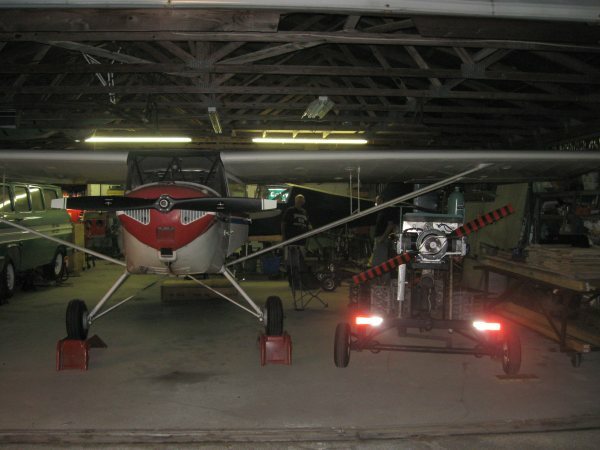 Grace’s Taylorcraft sits on ramps because we live in a flash flood prone lot, and it is hurricane season. The ramps also offer enough clearance for engines on the stand to pass under the wing when going from the workshop to the ramp in front of the hangar. New engine safely tucked away, we will run it several more hours this week. Behind it Vern stands next to his project, the blue fuselage of the Wagabond is visible, Grace’s Corvair van up on jacks for a transmission change, a task that will have to wait until the end of the Northern flying season after CC#27. A long time ago, I came to the observation that I had never actually met any human so rotten and worthless that they actually deserved every bad thing that happened to them. Neither had I met a single person who was so good and virtuous that they had earned and deserved every good thing that had happened to them. You can abdicate from caring about humans with broken lives by pointing out the superficial truth that they caused much of the trouble they have, but every time I look at such a person I am far more inclined to think that without the great fortune of being born to my parents and the love of family and friends, I easily could have been them. “There but for the grace of God go I” is not a religious statement to me, it just seems like a realistic assessment of the diminished possibilities when one is born with one foot in an emotional grave. Very similar, I have met a great number people who were convinced that they had 100% earned, all on their own, or even in spite of all others, every single good thing in their lives. While that storyline may support the self narrative of their lives or their “me first, me only” actions and philosophy, I can’t believe, no matter how hard-working they are, that all of their success was purely self-generated. Experience suggests that they were also the unearned beneficiaries of countless acts of kindness and generosity, fortune of birth, and random favorable chance, even if admitting this would spoil their self-image as a leading character in some unwritten Ayn Rand novel. Two weeks before Oshkosh, The family of Tom C. the oldest resident of our airpark, came to take him to live his remaining time with them. At arm’s length, Tom was a very crusty character, antagonistic, confrontational, intoxicated. He had lots of pets, which he loved, but never seemed to know how to care for them; from a distance he was a puzzling mix of conflicting signals and actions. One day I actually had a private conversation with him and found out in a few minutes that when he was 17, he was with the 7th infantry Division at Chosin, a member of RCT-31. Barely more than a boy, he had lived through an experience that few people could imagine. At an age where many young men are just being awarded a high school diploma, Tom had just been awarded a lifetime supply nightmares that would never leave him, even when he tried to drown them in alcohol. He told me had never been good with people, but had faked it well enough to get by in life until he was 70 or so, and then something changed, and he was overwhelmed and had just felt more isolated since. He told me that the only person at our airport who regularly spoke with him was Alex. I thought about all the times I had driven past this man standing in his yard raking leaves, driven past because one or two other people had just said to leave him alone, he was trouble. To this hour, I remain ashamed of how easily I allowed other people to decide for me who was a human being and who was not. If you are hoping for an uplifting ending, worthy of a TV drama, sorry, honesty will not allow it. Truth be told, I wouldn’t have wanted Tom as a father, teacher or even a next door neighbor. He was not easy to like, and I am pressed here to name any really redeeming character features. 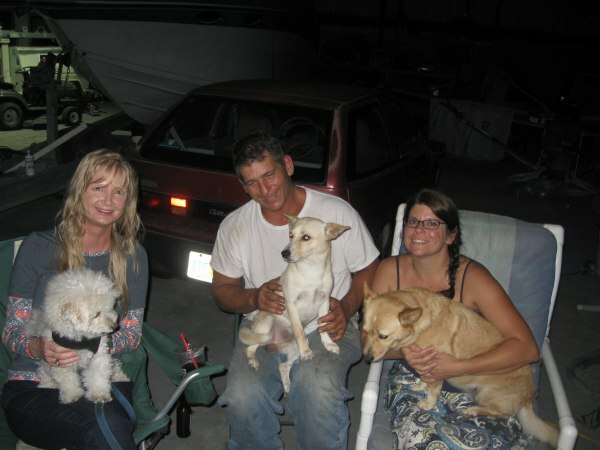 His family really only showed up because they hoped he had something left, which he didn’t. On his last day at the airpark, which also happened to be a Sunday, I said to a number of people who had previously butted heads with him that it was their last chance to go down and close things with a few kind words.